Edibility: Varied- but probably won't taste good, almost impossible to ID, and may be poisonous. Why bother? As I mentioned in a post about another Russula, these buggers are almost omnipresent, not safe to eat (unless you are incredibly good with your Russula taxonomy) and you're going to find far more of them than what you are searching for. This has led to them being referred to as JAR's (just another Russula). There are probably at least 2-3 red Russula species in the area- and possibly many more. For my purposes I shall call them all Red Russulas. Thus far in 2009 the chestnut bolete has been the only edible I have found (and only 4 of them at that), and I have probably seen 200 Russula's with bright red caps. Identifying features include a fairly dry cap, generally brittle, and a bright red cap. The stems of most of the red JARs I have found have been fairly pure white. They are normally 1-3 inches wide and sit just a couple inches tall. The only similar mushroom I have found is a milky cap species that has a similar red cap. The milky caps are named thus because if you draw your finger across their gills they will exude a milky latex in quite copious quantities. Happy hunting and let me know if you figure out how to tell the various species apart! At the moment russalas are propably most common edible mushrooms in Finland. I think them as safe to collect, since at least in Finland there are no poisonous russala species. Some russulas are almost impossible to name, but edibility is easy to check. It is to taste it. I taste small chunk of mushroom, usually from the gills and check if taste is mild or something else. If it is mild, then it is edible. Ofcourse I spit it away. If it was one those non-edibles, taste is so bad that I do automaticly after few seconds. Some edibles have a bit acrid taste on the gills especially when they are young, but their taste is still very mild. 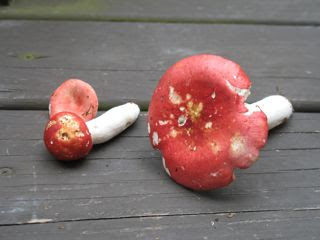 There is only one edible red capped russula here: russula paludosa and it is delicious, and huge. Definitely worth to collect. Non-edible red capped russalas are usually smaller, their cap is brighter and they may have reddish tint in leg too. Those with blueish or brownish tint in their reddish caps are another story then. They are also delicious and there are less similar non-edibles than with reds. Yellow capped are probably easier to recognize. Just yesterday there was a forest full of yellow swamp russulas. There are other yellow capped russlas here too, but those are smaller, have a bit different tint of yellow and are also edible - just not as good as russula claroflava. There are more than hundred russula species in Finland. I bet that in New England there can be even more! Thanks for the scoop on the russulas in Finland! In general I have shied away from most of the gilled mushrooms so far- we have enough tasty boletes and similar that I can normally find something good and be pretty sure of what I am getting into! Drop a line if you visit New England and we can go for a hike.